So I'm on a pumpkin kick, as I'm sure everyone is at this point in Fall. I'm tailoring my activities to support my pumpkin needs! I'm targeting same and different with my kiddos, or compare/contrast depending on the group I'm with. I've been taking it back to basics with my Kinders, because when you think about it, compare/contrast is a little difficult to do when you don't know same/different basics! In an effort to target these skills, I put together a pumpkin sort! Students use a sorting mat to determine whether or not the pumpkins are the same/different. 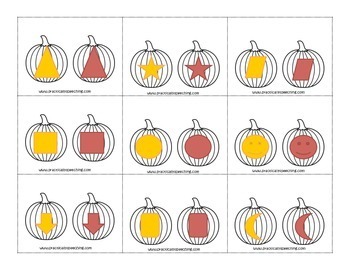 The pumpkins are coded with shapes and different colors to keep it simple. Since my kids are obsessed with anything Halloween at this point, they're thrilled to be sorting pumpkins! They each work for a candy corn to keep it really Halloween-y! Download the sorting game for FREE here on TpT.